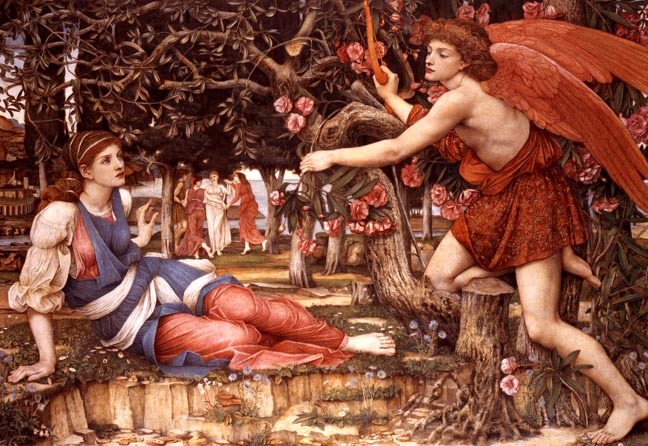 Love and the Maiden by John Roddam Spencer Stanhope (1829-1908). 1877. Tempera, gold paint, gold leaf on canvas. 138 x 202.5 cm. John and Julie Schaeffer Collection, Sydney Australia. Trumble, Angus. Love and Death in the Age of Queen Victoria. Adelaide: Art Gallery of South Australia. 2002. Wood, Christopher. The Pre-Raphaelites. New York: Viking, 1981.